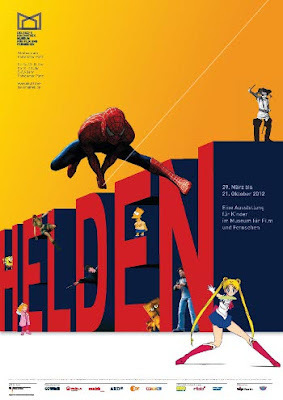 Kanonenfrau: More new exhibitions in Berlin! More new exhibitions in Berlin! Two new interesting exhibitions in Berlin! Very interesting is the section about "how heroes are made": costumes, stunts, special effects, etc. There are also film projections and cartoon workshops. I am not a kid anymore but I might go there as well, I hope they let me in! This exhibition is dedicated to the actual trend of "Do it yourself". It was very common and very cool in the 60's and 70's to do stuff on your own, then due to the economical craze from the 80's on, we lost the need of creating with our hands and also repairing things. We learnt only how to buy, consume and throw away, quicker and quicker. Since a few years people are getting back to DIY kind activities and, somehow, way of life. Websites like "DaWanda", "Etsy", "Craftsters" are promoting and taking together people with this passion, a passion that in the last years has become also necessity. The world, thanks to DIY can also be a bit more colorful and less expensive and commercial. I am very curios to see this exhibition and on the website you will find many interesting links. Beside the exhibition there are open workshop.